Obviously, you should be concerned about the cost of quality legal representation. I start the process with a free consultation to become familiar with your case. My consultations normally take thirty minutes to an hour, and I take great care in evaluating the specific facts of your case. Initially however it is unlikely either one of us will have the discovery materials from the government, or any additional investigation; this consult is just to explore the framework of your case, and is not the time to provide specific legal advice. Normally, I use a “flat, fixed fee” for criminal cases. With this type of retainer, the client will know exactly what my attorney’s fees are, with no additional billings later on. This flat fee method is far preferable to the “hourly billing” for cases since there will be no surprise fee billings later on. In more complex cases, such as felonies, I charge a fixed, flat fee for each stage of the case proceedings. In all cases, I want the client to know in advance exactly what he or she will be charged for the case. In each case there are estimated costs included in your fee agreement; for direct expenses like filing fees, record requests, service of process, or investigation. I estimate this budget for each client to help in financial planning. My goal is to arrive at a fair yet adequate retainer to handle each client’s case. A strong word of caution: “price shopping” for a criminal attorney is as foolish and dangerous as price shopping for a doctor. Remember, no one ever regretted having a good a lawyer when faced with criminal charges. We may employ a sliding scale for those clients that cannot afford the regular fees and costs for their cases. The firm however does not take more than a few cases per quarter on such a basis, for obvious reasons – the expense of any given case must ordinarily be paid to allow for adequate representation. Any sliding scale case indicates an effort by this firm to, in effect, finance your case. Please contact me to arrange for a free consultation, evaluation, and retainer quote for your case. If you decide to retain me, I accept major Credit Cards, your personal or business check, Paypal, or cash. 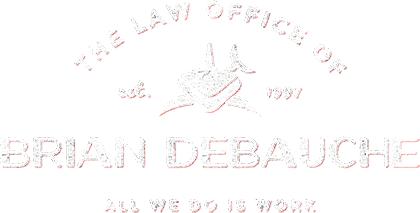 You may reach me, attorney Brian DeBauche, at (303) 571-5023, or by email at debauchelaw@comcast.net.